Coleraine's scoreless draw with Glenavon at Mourneview Park left the Bannsiders as runner-up in the final Danske Bank Premiership standings. Victory for Crusaders over Ballymena United secured the Belfast club a spot as Gibson Cup winners following a dramatic title race which went right down to the final day. Coleraine's Stephen O'Donnell in action against Glenavon. 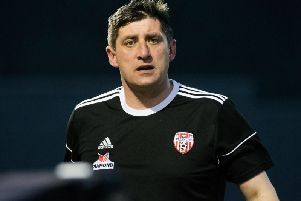 O'Donnell spoke to Johnston Press' Steven Crawford after the final whistle in Lurgan to reflect on the Irish League run and hopes for next week's Irish Cup final.